For Pinya2, I wanted to try a different extrusion approach: air extrusion. I have been playing with peristaltic extrusion, stepper driven syringe extrusion, … so I ask myself why not to try air compressed extrusion. There is lots of comments regarding which one is better or worst. At the end I think is a matter of which method is more suitable for our application. Frostruder MK2, Baricuda, Unfold, Laser Lab Studio … many people using it yet not much information available. But for sure an awesome starting point (at least for me). Basically, we load a syringe with whatever we want to print and using air compressed we are able to extrude it. The high pressure build inside the syringe forces the material out (through the nozzle or leaks). The material flow is controlled with a combination of its viscosity and the air pressure. The ON/OFF flowrate is accomplished thanks to a “valve” that activates or reliefs the pressure inside the syringe. There is different approaches to this job: selenoid valves, glue dispensers or manual valves. We took the glue dispenser route, due to the hint by Laser Lab Studio (thanks a lot). 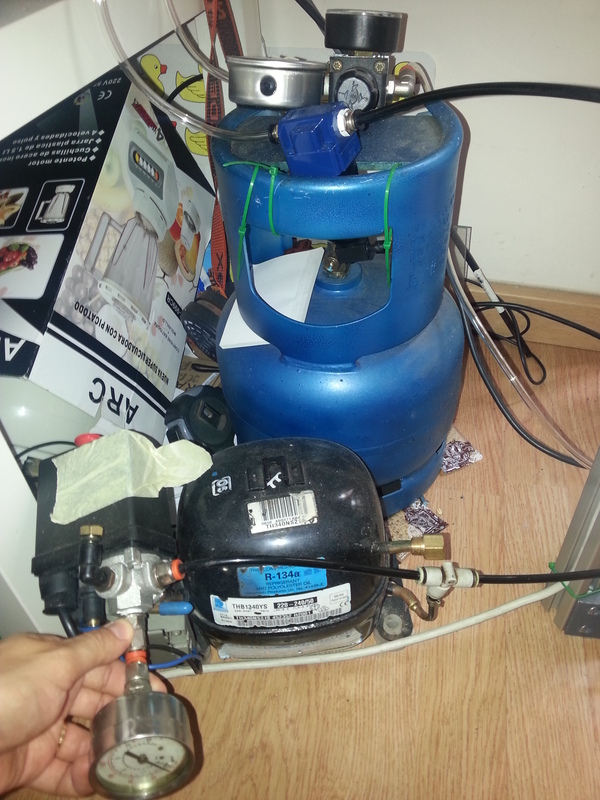 Once we have a compressor, we need to control and know the maximum pressure we want to connect to the glue dispenser. 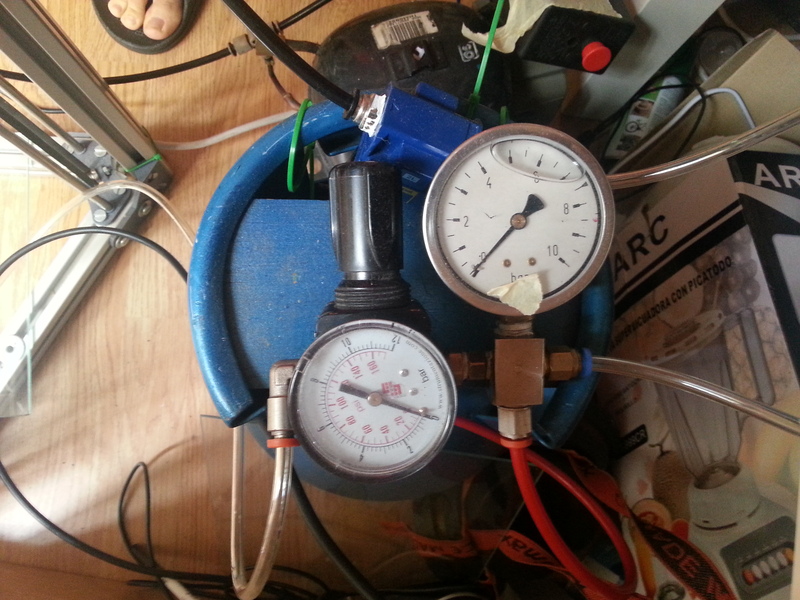 This is done with a pressure gauge and a regulator valve, often found in the same pack. After that a filter stage is added to “clean” the compressed air. Currently I just have a 50um filter, mainly because filters are expensive and I am just playing at home :). This is the one in charge of providing a stable pressure at a desire value into the ingredient syringe. 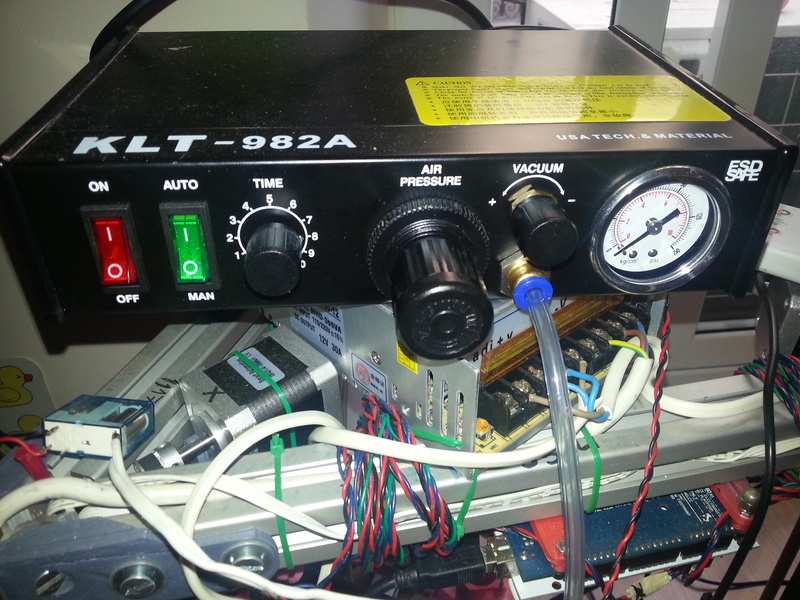 It is controlled externally through a pedal input. Offers different operation modes, auto or manual (we used just manual so far). 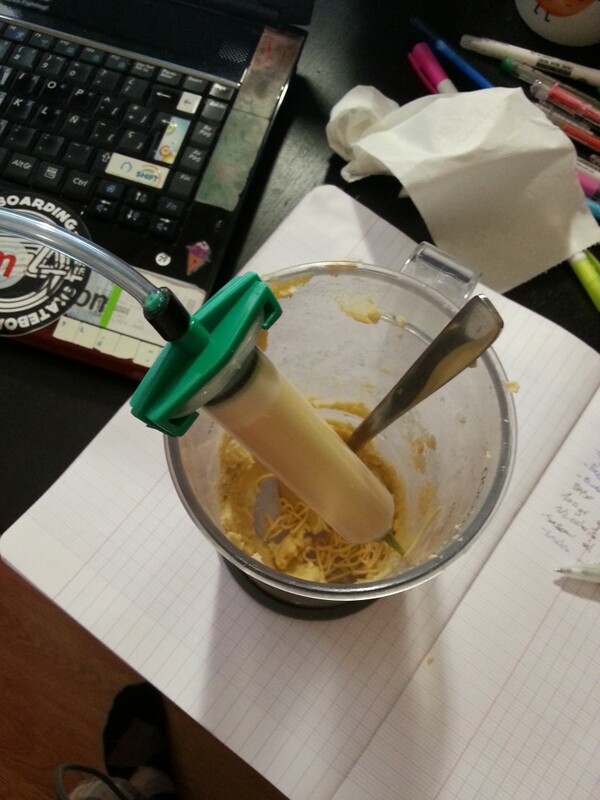 And have a vacuum control that it is able to apply negative pressure inside the syringe when the extrusion is not ON. There is lots of different types of dispensers, also all sort of price ranges from 60€s to thousands. I just have been able to try a cheap version, but for me “does” a good job. In the electronic side, I am just using a regular ramps+arduino to control the printer. 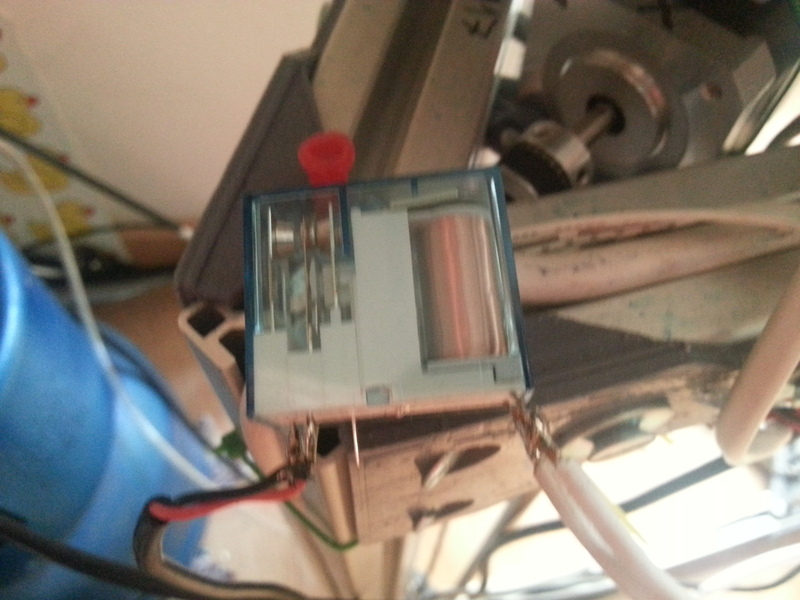 I added a relay that emulates the pedal to trigger the glue dispenser. The relay is connected to the heated bed ramps output. So the way that Baricuda works is adding two variables to control the valves. These values can be updated through GCode commands. Later when planner line blocks are calculated the current value of those variables are added to the new block. This function is called within manage_inactivity() meaning that is refreshed “a lot” of times when the main loop is waiting for some action to finish. I have not been printing as much as I would like, but I share my opinion so far with this extrusion tech. My first impression was wow, that easy? AE has the strength to handle really thick and viscous materials without having to worry. This allows to push and print really fast (printing fast > quality). Syringes, are limited in printing volume. Filling, refilling, rerefilling, rererefilling, is my normal routine during a print session. I still have to try bigger syringes hoping this would improve without “side effects”. Loading the syringes its already an art. Any air trapped will ruin your prints (depending on printing material the drama would have different dimensions). It is and easy method to set up, but a difficult one to master, many variables at the same time to be able to have decent repeatability. Hi Sir, This is Venkatesh. You did excellent work. Which ramps1.4 pin you used to activate and deactivate solenoid valves! Sorry I dont really remember it was a long time ago. I think the firmware allows to change that and use different ones. Probably one of the heating elements output.